They Act Guilty About Russia & Incompetent Trump Cabinet…. President Trump’s personal attorney Michael Cohen says he will plead the Fifth Amendment in the case brought by adult film star Stormy Daniels. Cohen made the assertion in a signed statement filed in federal court Wednesday. He said in the filing he would assert his Fifth Amendment rights against self-incrimination because of a criminal investigation targeting him, which led to his New York office, home and hotel room being raided by federal agents earlier this month. Cohen said federal investigators seized various electronic devices and documents, which he says include information pertaining to a $130,000 payment Cohen made to Daniels to keep her silent about accusations of an affair with Donald Trump. In a filing Wednesday afternoon, attorneys for President Donald Trump told the federal judge overseeing the investigation of his personal attorney, Michael Cohen, that Trump would, as necessary, personally review documents to ensure that privileged information is not revealed accidentally to the FBI or prosecutors. “…Our client will make himself available, as needed, to aid in our privilege review on his behalf,” wrote attorneys Joanna Hendon, Christopher Dysard and Reed Keefe in their filing. The filing is part of the ongoing effort by Cohen and Trump to get the first crack at reviewing records seized earlier this month from Cohen’s home, hotel and office. So far, US District Judge Kimba Wood has ruled against Cohen and Trump, though she has said she would be willing to consider their backup request to have an independent third-party review record before prosecutors and agents do. By asserting that the government would not be able to “flip” Cohen, Trump invited a question: If the Russia probe is the “witch hunt” the president says it is — and if he is as innocent as he so often proclaims — what incriminating evidence would Cohen have on Trump that would give him leverage to flip? It was only the latest instance of the president adopting a posture vis-a-vis his legal troubles that is both combative and defensive — and, perhaps unwittingly, seems to assume guilt. Third, Chicago Mayor Rahm Emanuel hit the nail on the head when he told an Axios gathering: “When we get to it, we collectively as a country will know it — as we did with, like, Richard Nixon. . . . You don’t just treat … the policy standard of impeachment … as a political tool. It’s a constitutional standard and, when that standard has been met, we’ll know about it. … This is a case where the best politics is good policy.” It is true impeachment is not strictly a legal matter; it is a process confined to the legislative branch. However, it should not be used for partisan advantage — or be seen as a partisan tool. Democrats would be very wise to stress in the midterms that any possible impeachment would be all about the facts. Prejudging the outcome — as Republicans have already done in declaring the whole thing to be a “witch hunt” — is irresponsible and violative of their oaths of office. Democrats would do well to assure voters that, to remove a president, the evidence and seriousness of the misconduct must be extremely compelling. Impeachment should not undertaken unless there is a large majority of Americans who find his conduct requires removal. Impeaching a president when a substantial percentage of the voters do not think it is warranted will result in resentments and animosity that will make our current time look like a kumbaya moment. In short, Trump’s incessant, dramatic prevarication will certainly cement the views of those who already think impeachment is warranted. To break through the partisan divide, however, will require a report so compelling that even Republicans accept its findings. The House Intel report was just released, which their investigations were a sham due to Nunes & his GOP cohorts. They didn’t press witnesses to answer the most important questions, & basically hid the most damning evidence to protect the prez, so it became a whitewash. But on the Dem side, there is disclosed even more evidence of collusion, including suspicious ties between the Russians with the NRA. See reports on that House Intel report in these articles: don-jr-met-with-russian-informant & also trump-campaign-used-poor-judgment-russians-house-report-says & also ex-cia-chief-highly-partisan-house-intel-report-means-nothing & also schiff-on-intel-report-gop-chose-not-to-seriously-investigate & finally House-Intelligence-Committee-releases-redaction-filled-report-on-Russia-investigation. Former Trump campaign chairman Paul Manafort was interviewed by the FBI twice while he was working as a political consultant for a Ukrainian political party — several years before he was named a top adviser to Donald Trump, newly filed court documents revealed. The documents filed late Monday by prosecutors in the office of special counsel Robert S. Mueller III, who is investigating Russian meddling in the 2016 presidential campaign, show that the FBI had interviewed Manafort in March 2013 and again in July 2014. Manafort’s deputy, Rick Gates, who also held a top role with Trump’s campaign, was interviewed by the FBI in July 2014, the documents show. The information raises fresh questions about how closely the Trump campaign vetted staff members and whether Manafort and Gates told officials about their interactions with the FBI. The machinations of August illustrate why Manafort is a central figure in special counsel Robert S. Mueller III’s investigation. And they show why the probe has deep roots — in evidence already made public, cases filed and plea deals won — that will persist even if Trump moves to fire Mueller. Manafort has pleaded not guilty to tax and bank fraud charges and making false statements — charges filed in two indictments, in Washington and Alexandria. His attorneys have argued that Mueller’s allegations about Manafort are outside the scope of his jurisdiction in the Russian election-meddling probe. The Manafort story, like so much in the Trump-Russia investigation, is a case in which many of the facts are hiding in plain sight. Mueller has released key details in court filings. Others have emerged in public documents, or in interviews given by the key figures. The Mueller files and other documents suggest a pattern of collusion, money laundering and coverup. They also show the loose oversight and vetting of Trump campaign personnel, and the multiplicity of attempts by Trump campaign officials to contact Russia-related figures, of which Manafort allegedly was part. Rudolph W. Giuliani, President Trump’s new personal lawyer dealing with the ongoing probe into Russian interference in the 2016 election, met with special counsel Robert S. Mueller III on Tuesday to reopen negotiations for a presidential interview, ­according to three people familiar with the talks. Giuliani, who joined Trump’s legal team last week, conveyed the ongoing resistance of Trump and his advisers to an interview with federal investigators, but did not rule out the possibility, the people said, adding that Giuliani pressed Mueller for clarity on when the probe is expected to end. In response, Mueller reiterated that he would like a chance to ask Trump questions about steps he took during the transition and early months of his administration, the people said. The special counsel emphasized, as he did in conversations in March with Trump’s team, that an interview is essential for investigators to understand Trump’s intent in making key decisions as they seek to wrap up the portion of the probe focused on potential obstruction of justice. Mueller’s investigators have recently asked about hacked and leaked emails from 2016, foreign money trails, the Trump campaign’s digital operation, President Donald Trump’s business dealings in Russia and Michael Cohen’s role in them, secret meetings in the Seychelles, and Jared Kushner’s foreign business dealings. The special counsel is even still investigating Paul Manafort, whom he’s already charged on 23 counts in two different venues. Plus, three former Trump aides have already agreed to plea deals and are cooperating with Mueller, though we haven’t seen the fruits of that cooperation yet. We also recently learned that George Nader, an adviser to the United Arab Emirates’ crown prince, has testified to Mueller’s grand jury in return for immunity. And there’s the forthcoming report on whether President Trump obstructed justice while in office. We don’t yet know whether any of these investigatory trails will lead to charges. It’s entirely possible that many or even most of them won’t. But it seems like a safe bet that some will. So here are the leading possibilities for where Mueller’s going next. As a former U.S. senator and state attorney general, I am increasingly concerned with the threat to our basic rule of law from the president of the United States. With new statements that the president is considering firing special counsel Robert Mueller and possibly other senior leaders at the Justice Department, it is time to call a halt. Simply put, Mueller must be allowed to continue his investigation and see it through to wherever the facts lead. There is no basis for attacking or ending this necessary investigation, which began amid real and deeply concerning evidence of foreign interference in our elections. After FBI director James Comey was abruptly removed last year, Justice Department leaders wisely selected Mueller to lead the investigation. His investigation is authorized by law and standing Justice Department rules, and there is no evidence he is abusing his legal authority. To the contrary, federal judges have ratified his efforts and the investigation has already resulted in evidence of wrongdoing. Dozens of serious charges have been brought and numerous guilty pleas obtained. The United States is built on strong legal pillars meant to ensure that no branch of government or individual may be a law unto itself. No one in this country stands above the law. Moreover, the Justice Department and federal prosecutors have long been governed by special rules and traditions meant to promote their independence and protect their work from political interference. Mueller and his team must be allowed to continue their work without intimidation or obstruction. Removing Mueller or forcing another official to fire him would not simply be an assault on the nation’s well-established rule of law traditions, it would embroil the presidency and the country in a legal and political controversy gravely damaging to everyone. The president must stop his verbal attacks on the Justice Department and its staff. Calling a lawfully obtained and executed warrant a “break in” and “attack on our country” is profoundly wrong and unhealthy for our republic. It is rhetorical acid that can corrode public faith in our irreplaceable institutions and the rule of law that defines our country’s greatness. It must end so we can allow special counsel Robert Mueller continue his work, and let us all continue with ours. The unprecedented alliance between the Republican-controlled Congress and the president against the Justice Department — which now includes calls for Mr. Rosenstein to be held in contempt of Congress or even impeached — has forced Mr. Rosenstein to share documents relevant to the criminal and counterintelligence investigations. Playing a weak hand, Mr. Rosenstein has made Congress spend time and energy to obtain documents, while aiming to live to fight another day. Has Mr. Rosenstein always calibrated correctly the benefits of compromise against its costs? Probably not; no human could. But he has been right to look at both sides of the ledger. Weeks before his firing, Mr. Comey disparaged Mr. Rosenstein in a private conversation with Mr. Wittes of Lawfare, saying he had “concerns” because Mr. Rosenstein is a “survivor.” In Mr. Wittes’s paraphrase, Mr. Comey feared that “you don’t get to survive that long across administrations without making compromises.” But sometimes the best way to do justice is to compromise with those who would deny it. By surviving, Mr. Rosenstein has preserved not just his job but also the integrity of an investigation into, among much else, possible wrongdoing by the president. Like the bamboo that bends but does not break in the wind, he has shown a flexibility that may have helped preserve our institutions despite the raging storm. In these links where Russia has successfully infiltrated our electoral process, they can only be more informed & better positioned to wreck even worse havoc in future elections: homeland-security-official-says-likely-russia-targeted-more-than-21 & russia-likely-targeted-more-21-states. Yet our leader is not only failing to prioritize putting up safeguards to stop them, he is basically doing nothing. In other international dangers, Trump is taking a hard line on the Iran deal: trump-warns-of-bigger-problems-than-they-ever-had-before-if-iran-ramps-up-nuclear-program. I believe we should take aggressive steps to stop the nuclear programs of Iran & North Korea, despite huge risks, since the world cannot tolerate rogue regimes having nuclear missile capabilities. But we’d better be smart about it before we spark WWIII. At least these are encouraging signs: koreas-kim-jung-un-moon-summit & also north-and-south-korea-agree-to-complete-denuclearization-of-korean-peninsula. It looks like they’re declaring an end to the war from the early 1950’s. As to denuclearization, we can remain hopeful yet leery. And I do emphasize caution: trump-is-claiming-north-korea-wins-before-the-game-really-starts. A perfect year would be Trump signing a de-nuke deal with Jong Un, then evidence of crimes forcing his resignation, so our prez can end his time on a high note. 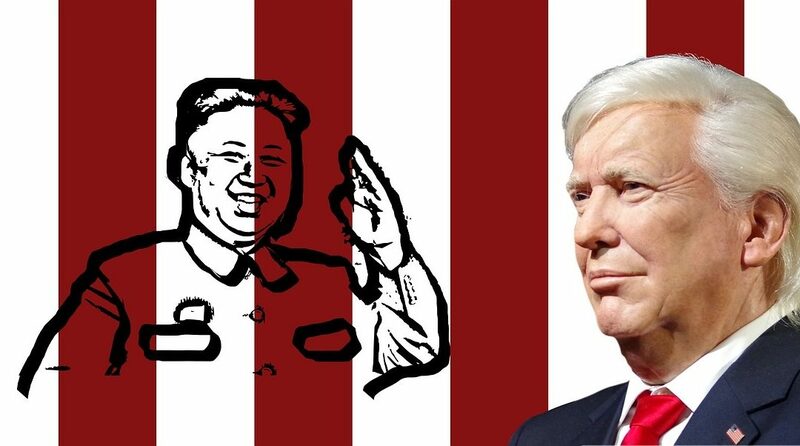 Striking a denuclearization deal with North Korea that actually holds up over time, could be the one & only way to legitimize the value of the Trump presidency. The levels of corruption in this administration are simply staggering, and they range from open self-enrichment to openly selling policy to the highest bidder. Pompeo did get confirmed for State. But other Trump Cabinet or prospective Cabinet members just oozing with corruption & incompetence are Pruitt & Jackson: democrats-scott-pruitt-ethics-scandal-whats-next & also this-week-in-trump-administration-corruption-mick-mulvaney-and-scott-pruitt-still-champs & then there’s coworkers-said-trump-va-nominee-flat-out-unethical-went-on-drunken-rampages-created-toxic-workplace & also ronny-jackson-president-trumps-pick-for-va-secretary-withdraws-his-nomination & also see the-jackson-fiasco-a-case-study-of-trumps-abject-unfitness. Dr. Jackson even earned a nickname around the White House: ronny-jackson-candy-man-drugs (see song at bottom of part 3). As I’ve said often, Trump corrupts all around him, although some of his cronies were plenty corrupt to begin with: will-anyone-leave-the-trump-administration-with-an-intact-reputation & also trump-orbit-crash-landing & check anderson-cooper-if-trump-only-hires-the-best-people-why-are-there-so-many & also trump-deserted-government & also gop-senators-losing-their-cool-over-white-house-vetting-fails & also how-a-week-of-triumph-for-trump-was-convulsed-by-chaos-and-contradiction & this one trump-can-blame-democrats-all-he-likes-but-his-nominee-problems-start-with-him. Rubin asks this forget-about-va-does-trump-really-want-this-guy-as-his-doctor & offers excellent advice for future presidents based on the many mistakes Trump is making: an-etiquette-guide-for-future-presidents.